If drawers are available for my Rack-it I’d really appreciate you including them. The drawers look very handy. Sorry Gazillion, that was the last 2 Drawer base I can find in the on-line market place. I did order one from a reseller but when I got it, they had an inventory mix-up they didn’t know about and they sent the three drawer base. I immediately reordered thinking it was just an oversight. They cancelled my second order when they realized they didn’t have any more 2 drawers available and their inventory had been mislabeled. I did a thorough web search and no one handles the 2 drawers any longer, at this time. There are Three Drawer Bases available. They are pretty large. Probably on the order of rack space for 42 to 48 stones. I made a rack with this same size 3 drawer base to store 56 stones, (28 pairs), without a problem. So that base is pretty large. Thank you for the update. 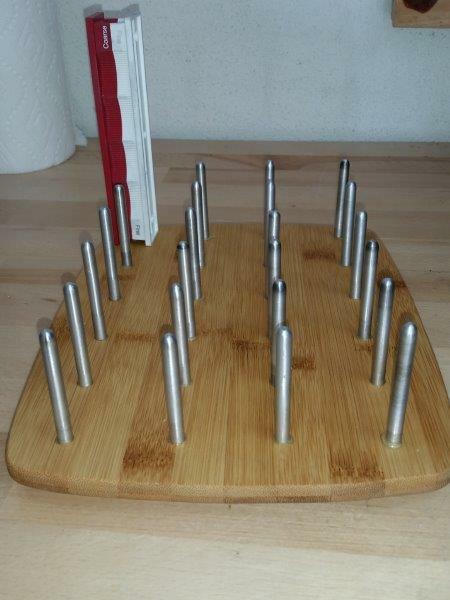 I think what you’ve made me is the perfect Rack-it for the space I’ve allocated. I’m eager to receive my Rack-it. I’ll update this post with a picture when it arrives. Sorry Gazillion, that was the last 2 Drawer base I can find in the on-line market place. I did order one from a reseller but when I got it, they had an inventory mix-up they didn’t know about and they sent the three drawer base. I immediately reordered thinking it was just an oversight. They cancelled my second order when they realized they didn’t have any more 2 drawers available and their inventory had been mislabeled. I did a thorough web search and no one handles the 2 drawers any longer, at this time. There are Three Drawer Bases available. They are pretty large. Probably on the order of rack space for 42 to 48 stones. I made a rack with this same size 3 drawer base to store 56 stones, (28 pairs), without a problem. So that base is pretty large. 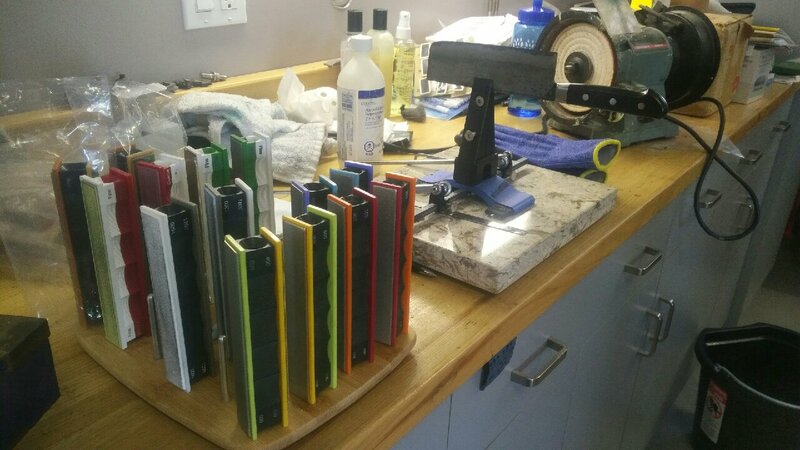 Here is a Rack-It I built-to-order for Loremipsum. 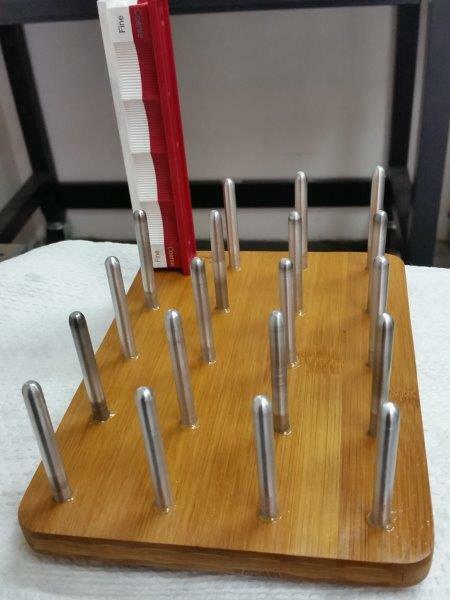 It is for 20 stones, 10 pairs, with aluminum posts. It’s on a small bamboo base, 6″ wide and 8″ deep. It’s foot print is fairly small. Perfect for a small workspace. Thank you for my new Rack-it. It turned out great! Marc, Received my rack today, “Outstanding Job”, great service. will get years of enjoyment using it. The drawers give me a place to put my sharpies & tools. Even if you pack your system up after every use a devise that holds your stones securely and accessible are invaluable in extending the life of your stones, strops and platens. The Rack-It helps prevent cross contamination and damage. I highly recommend the Rack-It! I own 4 of them so I can separate my mediums and I have limited space so smaller racks work better for me. Here is the Rack-It I built for Jeff. It’s due to arrive today. 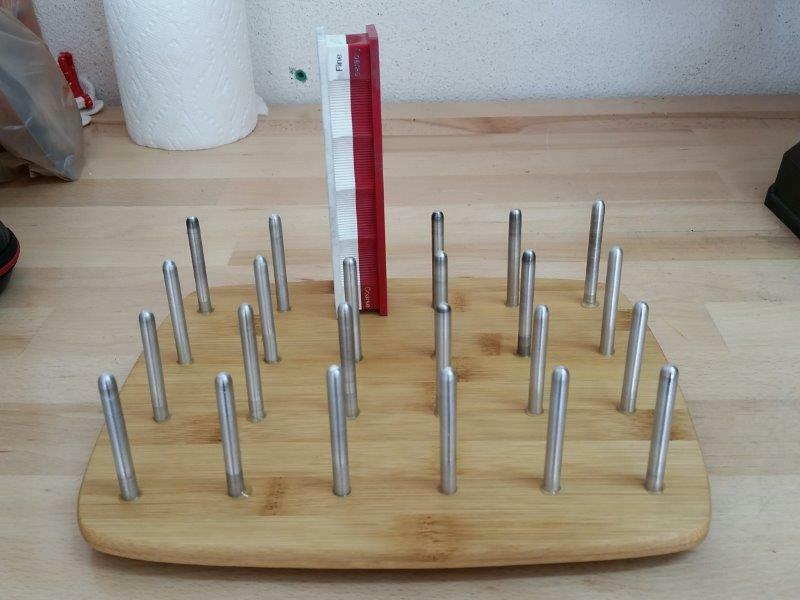 His rack has an even number of pegs both front and side so it lends itself to either orientation: narrow front forward or wide side forward. This allows you to use it on your workspace in the direction that best accommodates it while still having stone pairs together, side by side. This thank you is long over due. I’ve been using the rack Mark built me for about 3 months now. Works awesome. My workbench may still be a little messy but no longer because of loose W/E stones. Mark is a great guy to deal with and he delivers a handy product. 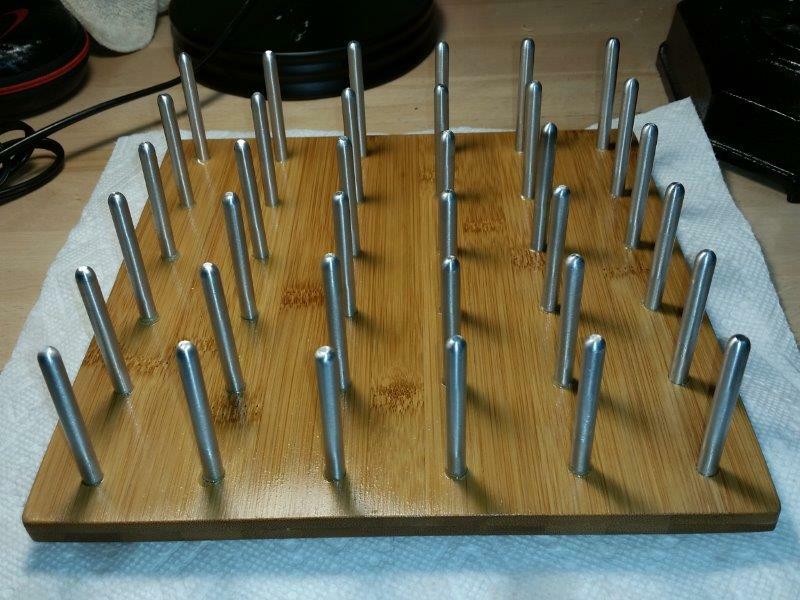 Here is a Wicked Edge Stone Holder Rack I just made and mailed off to one of our newer WE Forum members. 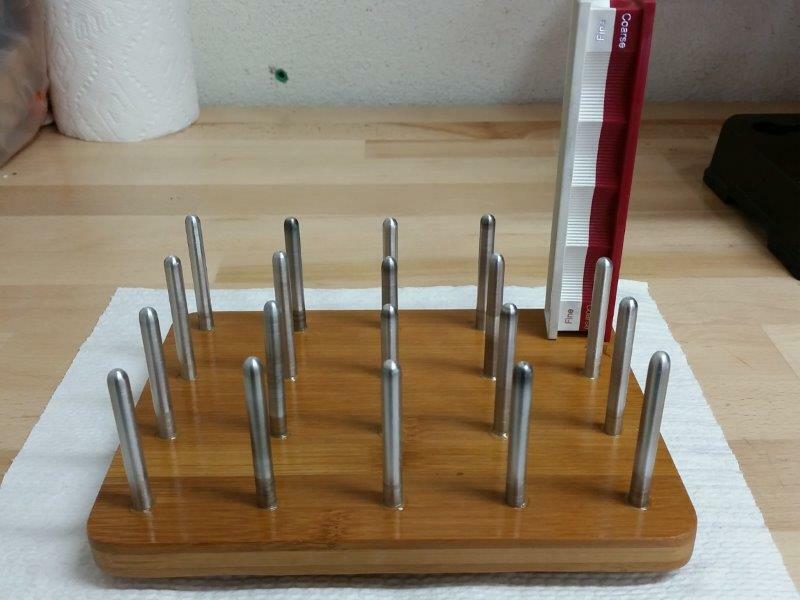 This one is 9″ x 9″ square with 36 Aluminum posts for 18 stone pairs. I have the plans/layouts to make “Rack-Its” with a capacity from 12 stones up to 84 stones using about 15 different, sizes and shapes, sustainable wood bases. Tell me what you need and I’ll show you how I can accommodate it. I have Rack-It layouts that are compatible with the WE Strop Covers, for those of you concerned with cross contamination using my open design Rack-Its. Yes I am, I’ll send you a Private Message shortly.